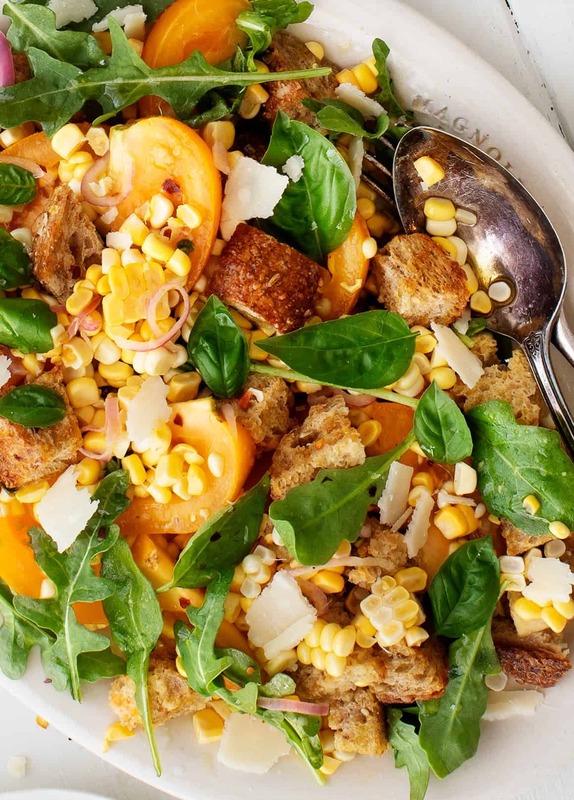 This Sweet Corn & Arugula Panzanella is a great vegetarian grilling side. Omit the cheese to make it vegan, or add a few chickpeas and some extra greens to make it a meal! If you said panzanella, you’re at the right place. 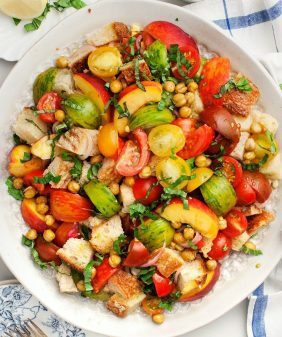 If you didn’t say panzanella, that’s ok too, because I think you’ll be converted after you try this one! 🙂 It’s the ultimate summer salad to make with a bounty of fresh tomatoes. Or in this case, if you have a few tomatoes and a bounty of fresh sweet corn. 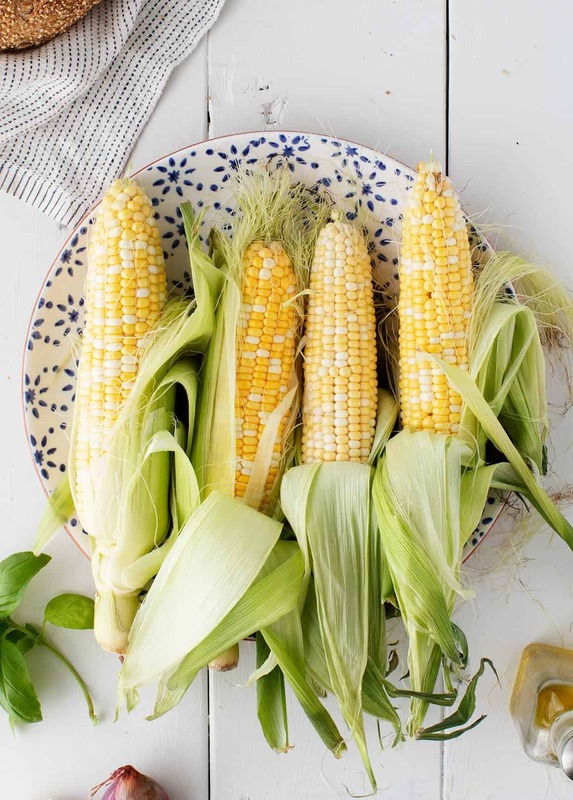 Plus, sweet corn is my favorite summer vegetable, and it’s just now coming into season, so I’ll be eating it pretty much every day from now until the end of September. 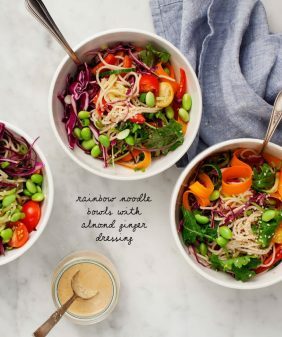 Did I mention that this salad comes together in just one bowl? It’s great to make ahead and it’s the perfect side dish to go with whatever you’re grilling. If you have a bit left over, make it into lunch the next day by adding some chickpeas and another handful of arugula. If you’re a panzanella convert, try this recipe with tomatoes, corn, and peaches and this one with sweet peppers and kale! 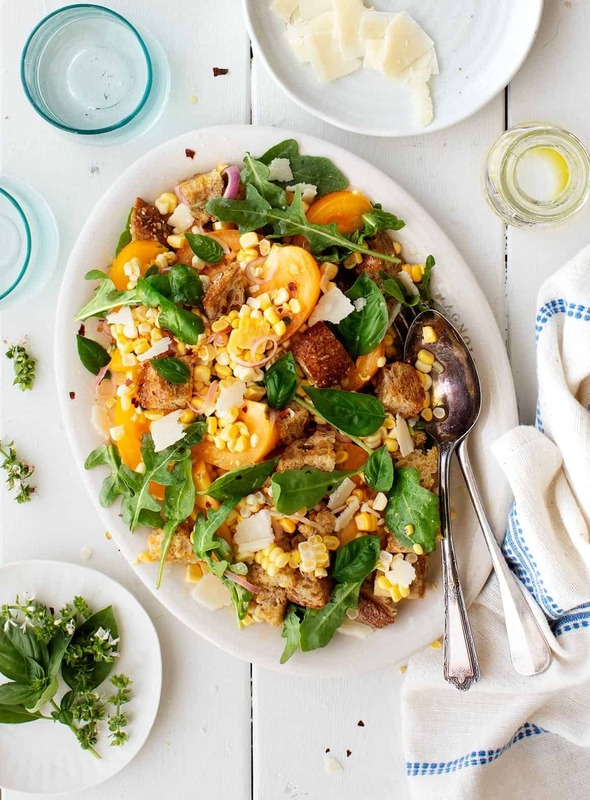 This one-bowl Sweet Corn & Arugula Panzanella is perfect for summer picnics! A healthy, satisfying vegetarian side, it can easily be made vegan. 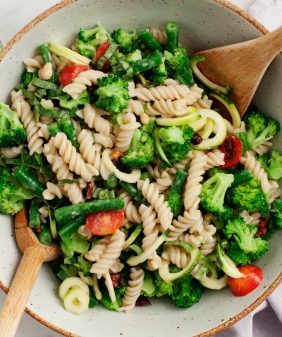 In the bottom of a large bowl, make the dressing by mixing together 3 tablespoons of olive oil, the vinegar, mustard, salt, shallot, and garlic. Set aside. 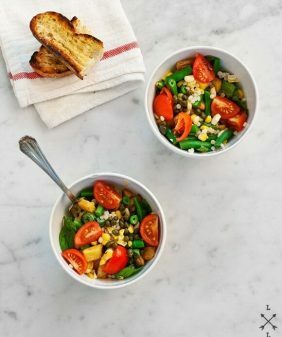 To the large bowl, add the (raw) corn, tomatoes, toasted bread, arugula, a few pinches of red pepper flakes, and toss. Season to taste with flaky sea salt (or regular sea salt). Spread onto a platter and top with the basil and shaved cheese, if using. Serve. 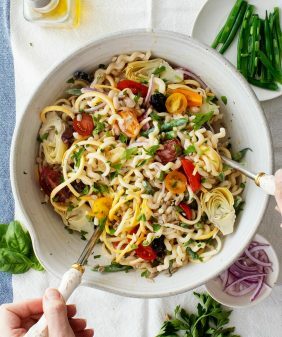 This is the most perfect summer salad! This looks fantastic! I’m such a fan of salads like this! if I make this ahead and won’t be eating eat for about 3 hours..should I refrigerate it?Thank you! yep, I would refrigerate it until then..
Do you put the corn in as is? So not prepared? correct – it’s not cooked, once it mixes with the oil/vinegar/tomato juices it’s wonderful raw! I was going to ask the same exact thing.. if the corn was added to the salad ust like that, raw. I bever had raw corn before… I’m not sure the type of corn cobs I get around here are sweet and tender enough to be eaten raw unfortunately… I should give it at try to and see how it tastes. I actuallt roasted lots of corns yesterday! Too bad I don’t have any raw one in the fridge right now. 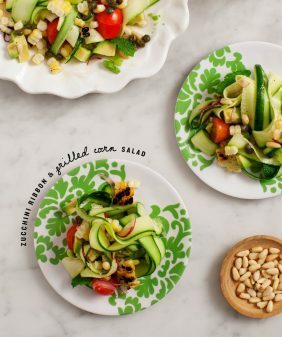 I love panzarella salads, they are delicious for summer, totally agree! This sounds like a great salad! Always looking for different recipes . I do not have sherry vinegar; actually never bought/tried it. Is there another vinegar that is a good substitute, or is it so different, that I really should buy a bottle? Hi Sally, you could use red wine vinegar or white wine vinegar – I love sherry vinegar because it has a nice flavor that’s in between both (and less strong than red wine vinegar). I tend to use it in place of red wine vinegar in any recipe. Hope that helps! Made this for a beach party last night, slight variation. The hostess wanted me to go heavy on the arugula. Followed the recipe but doubled the dressing and used 4 bunches of arugula. Delicious!! I do not usually use sherry vinegar, nice change. With most of the greens gone at the end of the night, I had a bowl which looked more like the recipe. I will make this again! !